UK General Aviation leaders have expressed relief that the government’s new draft National Planning Policy Framework (NPPF) specifically recognises the importance of General Aviation for the first time. 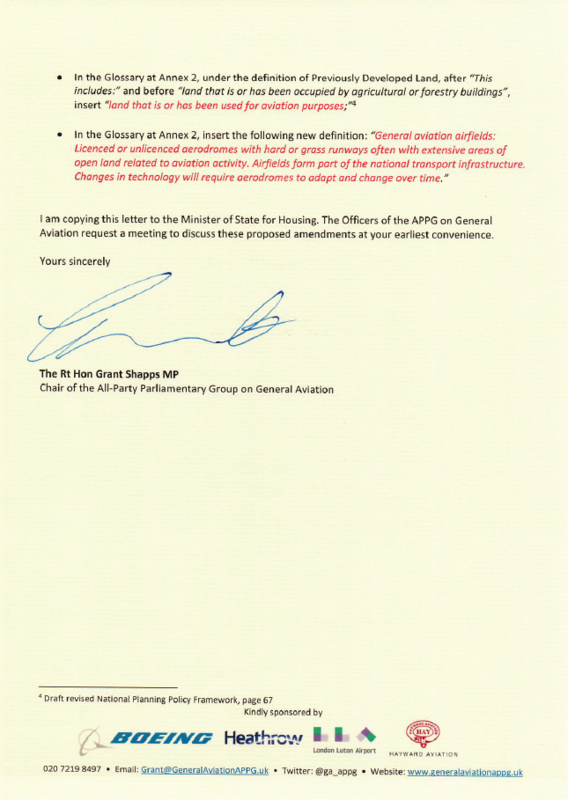 However, despite the new breakthrough paragraph, the All-Party Parliamentary Group (APPG) is calling on everyone who wants to see a thriving UK General Aviation sector to respond en-masse to the NPPF consultation by proposing four further small amendments. Parliamentarians claim these minor tweaks are “absolutely essential” to protect and enhance the UK’s General Aviation sector; which is worth £3bn to the economy, directly employs 38,000 people in high-tech jobs and forms the basis of the far wider £60bn+ aviation sector. “If we are to maintain and enhance our position and deliver the government’s own stated objective of being the best country in the world for General Aviation, then the NPPF needs to make four further small changes. That is why I have written to the Secretary of State for Housing, Communities and Local Government, The Rt Hon Sajid Javid MP, asking for four simple amendments that would make all the difference. The APPG is asking all parts of the General Aviation community to back the proposed amendments by visiting www.generalaviationappg.uk/nppf today. The whole process takes less than 60-seconds, but could keep General Aviation vibrant for future generations. The group’s full letter to the Secretary of State for Housing can be found below. The consultation closes on 10th May 2018. In paragraph 105, subsection (f), remove “maintaining” and insert “protecting, maintaining and enhancing”. 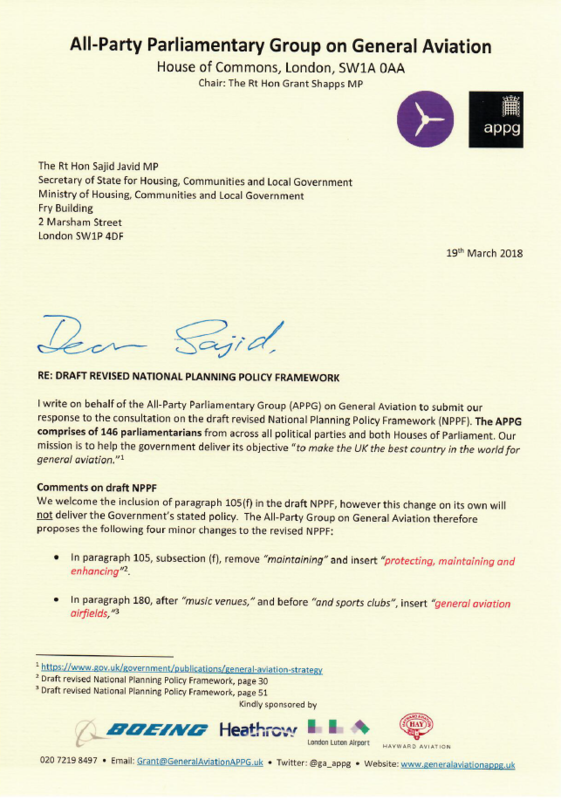 The www.generalaviationappg.uk/nppf website allows visitors to fill in their name, address and email and their submission is then automatically sent to the Ministry of Housing, Communities & Local Government consultation response. It also allows the APPG on General Aviation to be notified of the consultation response in order to track responses and keep consultees updated on progress.